The System Restore feature in Windows can be a handy feature, as it enables you to rollback recent changes made to the system. It can be used to remove recently installed Windows Updates or software installations. While it is not a full-fledged backup system, it offers options to rollback recent changes made to the system if something goes wrong as a consequence of these changes. For most users, System Restore is running quietly in the background. That's quite ok, but if you want more control over the process, you may run into troubles finding the controls to do so. The easiest way to access the System Restore control program of Windows is to tap on the Windows-key, enter System Restore, and select the appropriate option from the search results. It is furthermore possible to manage System Restore from the Windows command line, or directly from your Windows disc. Update: System Restore is still part of Windows, but it is not enabled by default in newer versions of Windows. Check out this guide to enable System Restore on Windows 10 PCs. The developer of System Restore Point Creator announced recently that he discontinued development of the program. We suggest you use programs like Veeam's free backup software to create full system backups instead. I have reviewed several third party programs in the past here on Ghacks Technology News that provide you with alternate interfaces that you can use to manage System Restore. System Restore Manager for instance provides you with options to create, restore and delete points, and to modify several of the preferences of the feature. System Restore Explorer on the other hand can be used to mount System Restore points so that you can access files saved by them. 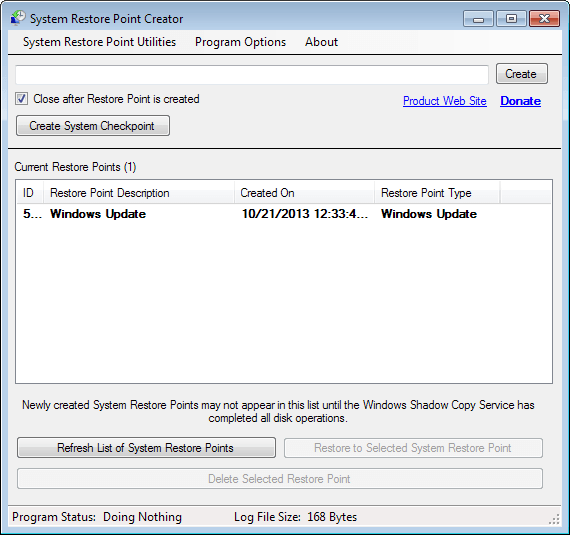 And now we have System Restore Point Creator, a free portable program for Windows. The core feature of the program is to create new System Restore Points in two easy steps. Simply select a name for the new restore point and click on the create button afterwards to create one. Note: if you do not want the program to auto-close after creation, uncheck the "Close after Restore Point is created" option. The main interface enables you to restore any System Restore point that is displayed in the interface, and to delete select ones as well. Here you can reduce the storage space that System Restore uses at a most on each drive, or schedule the creation of a new System Restore Point, which is an interesting feature. If you want to automate things further, you could configure the program to create a new restore point at logon. A first version of Restore Point Creator 4.0 has been released on May 10, 2016. It improves compatibility with Windows 8 and Windows 10 systems, and resolves a issue on those systems where System Restore points were automatically deleted by the operating system 17 days after creation. System Restore Point Creator provides you with a simple easily accessible interface to manage the System Restore feature of the Windows operating system. It offers all the functionality that you would come to expect from a program of its nature, and additional features that add to the usefulness of the application. Martin, I’ve been using Restore Point Creator for a few weeks now. There are two nice features I like. One is that it updates itself in the blink of an eye. And two is that when I create a restore point it gets added to Shadow explorer and I can use that to quickly recreate a damaged program from that particular point without having to set everything back to a certain date. Since I create a lot of restore points before installing programs and after uninstalling them (and customizing software), I’ve been looking for a program that’s a little better than the functionality of Windows system restore. Thanks, Martin!